No time for a cigar tonight, but I've got a minute to tell you about the Padron that I smoked last night. First, my son, my wife and I, spent the afternoon up at the Seattle Premium Outlet Mall, which just happens to be on the Tulalip Indian Reservation, which also just happens to be next to the Tulalip Casino. We were going to stop by the Casino and do a little gaming after the Mall, but we ran out of time - my son had to get back to town to take care of some business. So after we had been home for a while my lovely wife says that we should go up to the Snoqualmie Casino for the buffet, especially since we had a 2-for-1 coupon. Heck, I'm not one to argue with that logic, so we get ready and depart for the Casino just after 7 PM. The weather yesterday was absolutely the worst - rain, more rain and on the way up to the Casino, SNOW, it was mixed rain and snow, but nonetheless it was snowing. JEEZ! Isn't it Springtime? So we pull up to the front of the Casino and the valet takes care of the car for us - by far the best valet service in the State. We go inside and head straight to the buffet, oh-oh, there's a line, a BIG line. What the heck, it's 2-for-1 so we decide to wait it out. 35 minutes later we're finally at our table. So anyway, the buffet wasn't all that great, but they did have a couple of things that were really good, the Alaskan King crab legs and the prime rib, both were excellent, I think I must have ate $25 worth of crab, easily! Strange when we finished and walked out of the restaurant - NO LINES! So now we're totally stuffed and ready to gamble, another interesting item was that the Casino had also mailed us a $10 coupon to gamble with, so I cashed in the coupon and we head to the slots. Amazingly enough with the $10 that the Casino gave us, we gambled for 2 hours. Not bad! Anyway, we had enough of the slots so we head to the Lit Cigar Lounge. I immediately go into the humidor and check out all they have to offer, which really isn't a lot, but it's good enough for guys like me. 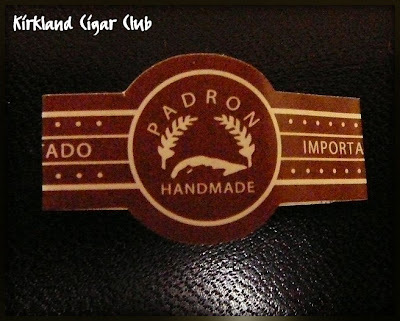 I pick out a Padron Series Maduro cigar. The gentleman behind the counter gives the cigar the usual preparation, cuts it with his guillotine, then gives the other end a little touch of fire, he hands it to me and I put the cigar to my lips, he lights it up and I puff away till it's fully lit. OOOoooooh boy, this is a good one. One thing that you may not know is that you can't smoke inside a public place (restaurant, bar, etc..) in Washington State, however at the Indian Casinos it's perfectly legal - kind of a weird law if you ask me. I head over to the bar and order a glass of Pyrat Rum, and a cappuccino for my wife. The lounge is packed, but we luck-out and get a table just as someone else was leaving. Time to sit back enjoy the rum, good conversation and oh yes, evaluate this fine cigar. I like Padrons and this one that I chose really looked good, the Maduro wrapper was just a little oily to the touch and the feel of the cigar was just a little soft, not too tightly packed. This is what I would call a medium to full bodied cigar - I got a little buzz off it, or was it the rum? Anyway, I took my time smoking it because I didn't want to get too much of a buzz and also because my wife would probably prohibit me from smoking cigars if I were to get sick. That would be a bad thing indeed. My wife actually smoked a little of it as well and thought it was pretty good. Good call Honey. I really liked it too. We finish up in the lounge, head to the front and the valet brings us the car. Oh look, it stopped snowing. Sweet! We had a really good time and the Padron was the icing on the cake. I was down at the Tobacco Patch on Friday night and my local tobacconist told me that he had a couple boxes of Magna cigars - "Magna cigars, you know the top rated cigar for last year in Cigar Aficionado!" I thought, no big deal, I'll come back some other time and pick one up. So I come back on Saturday night and there are only two left. WTF? The tobacconist said "you better hurry up, they're almost gone", plus he had said that he wouldn't be getting another shipment of these in for quite a while. The price was good, so I decided to pick one up. Here it is Sunday night and I'm smoking this lovely cigar right now. OK, those boys over at Cigar Aficionado know what they're talking about. This is really a GREAT cigar. Packed a little tight, you'll need to draw a little harder on this, but it's not bad at all, plus it delivers! I don't know how to describe it other than "delicious". It's smooth as Hell and burns like a Cuban cigar - perfectly. Would I buy a box of these? HECK YES! This is one of my new favorites. OK, so a friend of mine just returned from Hawaii and brought us a few gifts - flowers, chocolates, a typical Hawaiian cutting board, some sand and this cigar that I'm smoking tonight. Volcano cigars. Ever heard of them before? I doubt it. This one is the Chocolate Mac Nut Flavored variety. Yes, you heard me correctly. I opened the glass tube that the cigar came in and immediately smelled the chocolate aroma. I said to myself: "is this for real?" So I grabbed a glass and took out the Balvenie Single Malt Scotch - might as well bring out the big guns if I'm going to smoke a chocolate cigar. (grin) Anyway, I take the cigar out and there's that chocolate smell again, too weird. I light it up thinking that somehow this is going to taste like chocolate as well - no, no dice. It taste just like a normal cigar, not even the wrapper has a chocolate taste, which I guess is good, because if it did I would have chucked it by now. The cigar is somewhat mild, a little tasty, burns well, heck, it's not bad! (did I say that out loud?) I can't say that I would go out of my way to buy one of these, but since it was given to me I think the least I could do is smoke it down to the nub. I'm enjoying it, of course the Balvinie Scotch might have had helped with this evaluation. So it snowed a bit yesterday, UGH... Luckily today it has all melted away, unfortunately they say more is on the way. Jeez, you'd think this was Colorado! Today was kind of cool because my son took me out for ice cream, then bowling and then we went and road on those Formula 1 go karts. GOD, that was a BLAST! What an adrenaline rush. My son really knows how to please his old man. So I was in Georgetown on Thursday and Terry the cigar rep just happened to be at Rain City Cigars dropping off a few items. I talked to him for a bit and he recommended a few different cigars, which of course I bought, but he also gave me a cigar out of his bag that isn't even on the market yet, he thought I might like it - Ambos Mundos. So here I am today with my German beer and this cigar that I've never heard of. Hmmm? Let's see how it taste. I lite it up, slowly, making sure that I give this cigar a chance to wow me. As I'm lighting it up, my senses are already kicking in, "I like this", this is really nice". I take a look at the cigar after it's perfectly lit and think "where have you been all of my life?" I take a big swig of my beer, which I might add is spectacular, and puff some more on the cigar. Man, this is really a good smoke - smooth as hell, extremely flavorful, in fact I like this cigar so much that I might have to make room for a box of these in my humidor, next to my Olivas. Did I say that I was going to put these next to my Olivas? Yikes, I can't believe I said that, but it's true, these cigars are moving right up to the top of my "must have" list. The cigar continues to WOW me all the way to the finish and I am totally in love with it. I definitely will buy them. It must be Sunday? 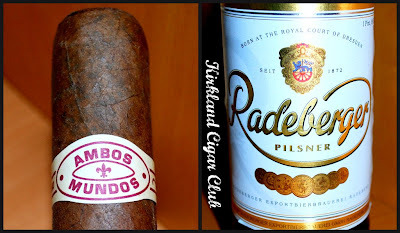 Time to rest and enjoy a fine German beer and one of my favorite cigars. Tonight I'm smoking an Oliva Serie G, of course, and drinking this excellent German Beer - Warsteiner Premium Verum. The little market that's close to home has a selection of beer that you wouldn't believe. Every week I try to pick up a couple of bottles that I've never tried before. I must say that I have yet to experience a bad German beer - they're all superb and I look forward to trying every variety that I can find! Not much new to report this week other than the fact that it snowed 4" on Thursday morning. What's up with this place! Sheesh! Luckily it was the kind of snow that you can drive on. I dropped my lovely wife off at work (she'd have to take the bus back home) and then drove into town - no worries. By the end of the day all the snow had melted - thank God I didn't take the bus to work! I've got to cut this review short - I decided to smoke this cigar before dinner tonight and the roast that I'm cooking just finished. Best give my rating and scoot out of here!